The Engrossing Effects of "The Walking Dead"
Stargate Studios uses LightWave 3D to deliver VFX for AMC's hit "The Walking Dead"
Television producers and network executives have, since the invention of the television, sought after a secret recipe, a combination of quality ingredients capable of delivering a blockbuster series. Audiences have, at the same time, been searching for a network program capable of consistently providing that perfect potion. AMC’s The Walking Dead has come closer than virtually all other series with its blend of compelling story, relatable characters, and seamless special effects. 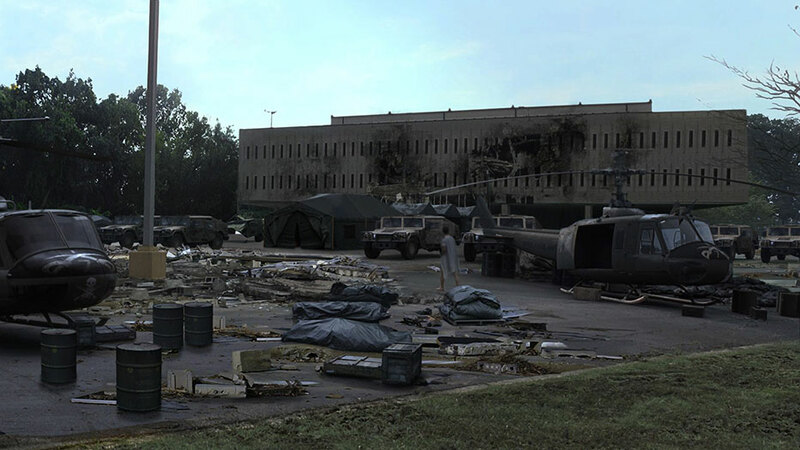 The creative concoction that is The Walking Dead blends real-world and computer-graphics (CG) elements, characters, and environments. Artists at Stargate Studios, an international production services and postproduction company, merge that which is real and imagined, as well as dead and undead, into a convincing, cohesive whole on a weekly basis. Based on Robert Kirkman’s popular zombie apocalypse comic book series by the same name, The Walking Dead has captivated TV audiences for two seasons and is already whetting appetites for its highly anticipated third season, scheduled to begin airing in October. The post-apocalyptic drama follows small-town Sheriff’s Deputy Rick Grimes (played by Andrew Lincoln) and a small group of survivors, including Rick’s wife Lori (Sarah Wayne Callies) and son Carl (Chandler Riggs), as they struggle to survive in the zombie-infested Georgia countryside. Stargate Studios has worked on The Walking Dead since the beginning, contributing eye-catching effects over all three seasons. 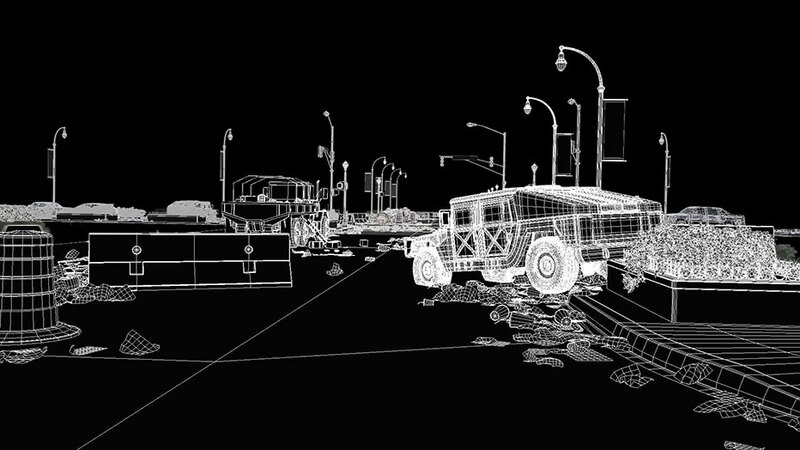 The show’s VFX and CG elements continue to grow in complexity and number from episode to episode, and from season to season. “The CG content varies from episode to episode, but always includes VFX shots where we’re adding virtual zombies, blood and bullet hits, wounds, and stuff like that. Fixing and cleaning up shots, which isn’t very glamorous, are also part of the package,” admits Al Lopez, vice president of creative services at Stargate Studios in South Pasadena, California. A little known fact, however, is that many of the show’s environments are actually the digital handiwork of Stargate Studios. Much of the show is shot on bluescreen, with artists crafting virtual sets, set extensions, and matte painting backgrounds. “We have built bidi (bi-directional) extensions, vision extensions, and multiple environments,” Lopez explains. Sweeping views of Hershel’s vast farm and the Georgian landscape are beautiful matte paintings inspired by a variety of different locales. The show’s premise, considered plausible by some and far-fetched by others, has mesmerized audiences, with help from the VFX craftsmanship of Stargate Studio artists. Although the zombie apocalypse circumstance holds no basis in reality, as yet, the artists consistently deliver realistic, organic effects that keep viewers immersed in the story. Even seasoned CG and visual effects (VFX) veterans find it difficult to determine what is prosthetic and what is digital—a serious accomplishment on screens big and small. Stargate completes all VFX and CG work within a 10-day turnaround for each episode. “From the time we get the plates in to when we have to deliver finals, it’s usually temps in one week and finals in two weeks—that’s a typical recipe for turnaround on The Walking Dead. When there is a big CG sequence, they try to get us some of those shots earlier and we might get an extra week,” Lopez notes. When an episode comes into Stargate Studios, the staff studies the script, looks at the shots, establishes what VFX elements are needed, and determines which artists are not only available, but also the best fit for a particular shot. Lopez, who oversees all 250 artists working throughout the company’s five international studios, is responsible for assigning shots on a number of hit TV shows to the optimal artist for each task. The size of the Stargate Studios team working on The Walking Dead can vary from episode to episode, based on the postproduction needs of each. Each show averages between three and five 3D artists and twice as many compositors, most of whom use two PCs and dual monitors. 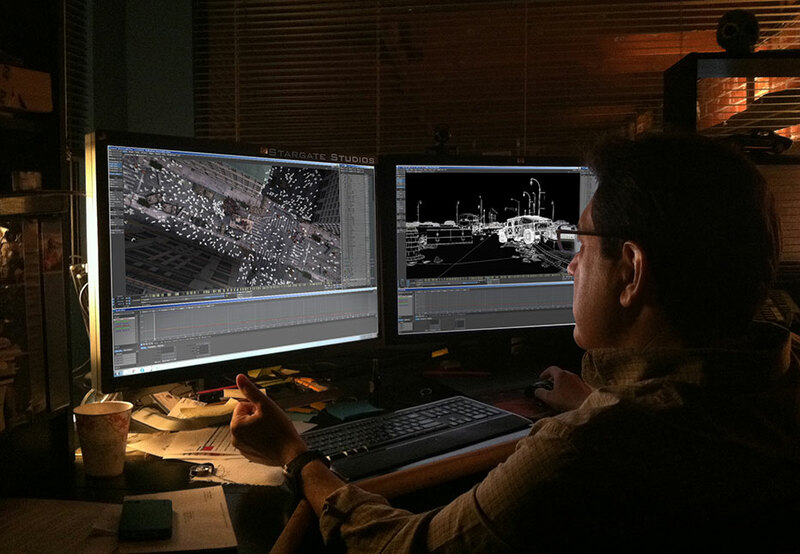 “Our main applications are NewTek’s LightWave 3D and Autodesk’s Maya in 3D, Adobe’s After Effects in compositing, [Vicon’s] boujou for tracking, and everyone has [Adobe’s] Photoshop,” Lopez mentions. Lopez brought LightWave 3D to Stargate for several reasons. “Bringing that package into the pipeline here really helped,” he affirms. “First and foremost, it allowed me to tap into some very talented artists. “I have been in television all my life as far as visual effects go, and it has always been a very fast tool for doing very high-quality work,” Lopez adds. “Achieving high-quality, photo-real images with the LightWave renderer is easy. It does an excellent job and it’s a fast tool for television. To me that has always been the edge and advantage to LightWave. “On TV, there’s a really fast turnaround and you are always going to say, ‘I wish I had more time.’ That is the biggest challenge. One of the things that has helped is LightWave. Its rendering has always been fast, especially for the quality you get, so it gives artists more time to work on a shot before we have to drop it on the farm,” Lopez enthuses. “That has always been a big plus. One of the more iconic shots from the first season of The Walking Dead was also one of the most complex models. 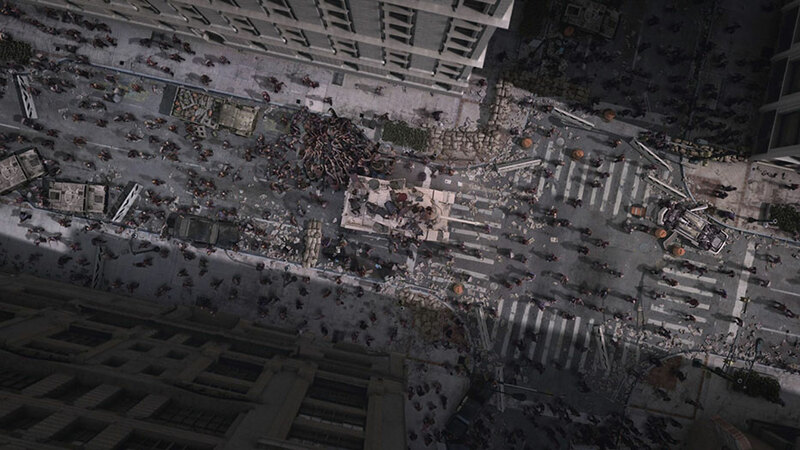 Grimes and other survivors are huddled inside a military tank surrounded by the undead or “walkers.” The shot pulls up from the tank, revealing the city of Atlanta overrun with an army of zombies. The tank and zombies immediately around it are real; the rest was built in painstaking detail by Stargate artists. 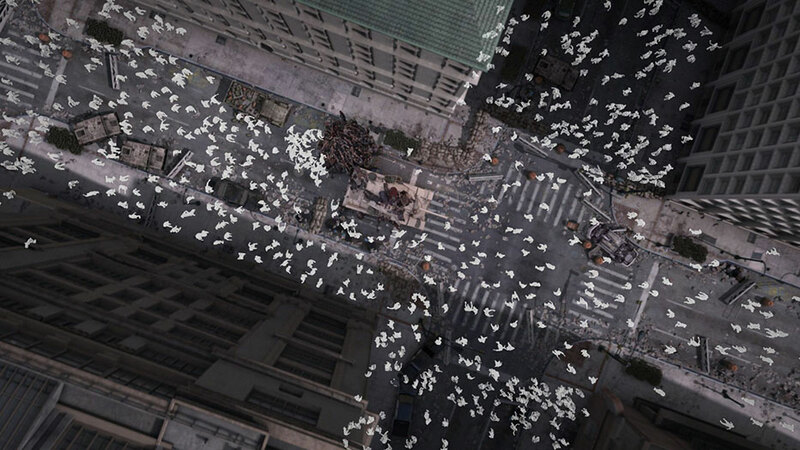 “The zombies, at that point, were primarily done in Maya but the entire virtual set—the buildings and the entire downtown area of the city—was done in LightWave,” Lopez says. Stargate artists are accomplished at extending sets and inserting CG elements next to real-world actors and vehicles, and doing so imperceptibly. “Integrating CG, photoreal models side by side with real, practical elements in the plate and no one knowing—that is one of the big challenges,” admits Lopez. The artists keep upping the ante, adding more detail to zombie actors and digital zombies. “We have 3D zombies, everything from deep background to close to camera,” he says. In another memorable scene, Grimes and the audience meet what people call “bicycle girl” or “torso girl,” who is cut in half and crawling on the grass. She is outfitted with prosthetics until her waist, and wears a blue, spandex suit from the waist down. “It’s a marriage of the two: CG and prosthetics,” says Lopez. “We replaced everything in blue” with digital intestines trailing behind, re-animated the grass, and blended the CG with the practical set. Courtney Howard is a devotee of The Walking Dead and an industry writer specializing in digital film, design, and entertainment technologies.